What Will You Learn At This Mobile Home Park Seminar? "I have to let you know your boot camp this weekend was one of the most exceptional presentations I have ever attended. Your poise, humor and comprehensive understanding of mobile home park investing made for a great three days." The #1 goal of the Mobile Home Park Investor’s Boot Camp is to make sure you learn the correct way to identify, evaluate, negotiate, perform due diligence on, finance, turn-around and operate mobile home parks – the skills that took us 25 years to learn. If we’ve done our job, there should be nothing holding you back from making offers and buying mobile home parks immediately following the event. Following the Boot Camp, you receive continual support through Quick Deal Reviews, in which you show us the details of the mobile home park you are looking at buying and we help you evaluate its potential, as well as the weekly Frank & Dave Show in which we answer live questions for an hour. We even give you our cell numbers so you can reach us in a deal emergency. In that way, the Boot Camp never really ends. You will leave this mobile home park class with 99% more knowledge than most of all the other buyers out there, and that will give you the edge you need to succeed. We have had many students buy mobile home parks within 90 days of attending this mobile home park training. Because our post Mobile Home Park Boot Camp Coaching is free, unlike most other real estate events, the focus is on information and facts. That’s why we have a range of attendees that include new investors, appraisers, bankers, stock analysts, and even current park owners who want ideas to improve their bottom line. Virtually all of the largest mobile home park operators in the U.S. even send their kids to us for training – that’s how well respected this event is in the industry. Frank & Dave are the 5th largest owners of mobile home parks in the U.S., with over 25,000 lots in over 25 states. They started with just one park and just kept buying more. 25 years – and 250 parks later – they have learned just about everything that can go wrong in a mobile home park deal, and how to fix it. They can show you not only what to buy, but what to avoid, and how to quickly tell the winning deal from the loser before you put your money at risk. Don’t have enough money to buy the great deal you’ve found? No problem, Frank & Dave will often co-invest in deals themselves, as well as pay assignment fees for you deal. They pay out around $300,000 per year in such assignment fees. Mobile home parks are the hottest sector of real estate right now, due to the endless decline in the U.S. economy. With over 20% of American households now making $20,000 per year or less, and another 10,000 baby boomers per day retiring into social security incomes that average only $14,400 per year, the demand for affordable housing is giant and growing daily. Mobile home parks are the only niche of real estate that grows stronger as the economy grows weaker. This contrarian hedge is why Warren Buffet is the largest owner of mobile home manufacturing and financing in the U.S. Its unique since virtually no new parks are allowed to be built and the fact that tenants can’t afford the $5,000 it costs to move a mobile home keeps revenues stable and makes it easy to raise rents without losing any occupancy. That’s why the largest mobile home park owner in the U.S. is Sam Zell, who was formerly the largest owner of apartments and office space in the U.S. Many investors are able to retire or meet their financial objectives with just one mobile home park. Here’s an example. If you have a 100 space mobile home park and raise the rent $50 per month, the increase in net cash flow is $60,000 per year, just in that one attack plan. Everything about mobile home parks is a function of the volume of tenants, coupled with the operating inefficiencies of the aging moms and pops and built these parks from scratch. Unlike flipping houses or buying and operating duplexes, you only have to find one or two great deals in your lifetime to make the entire exercise worthwhile. And the Boot Camp will be the invaluable tool you need to find, purchase and operate these parks. 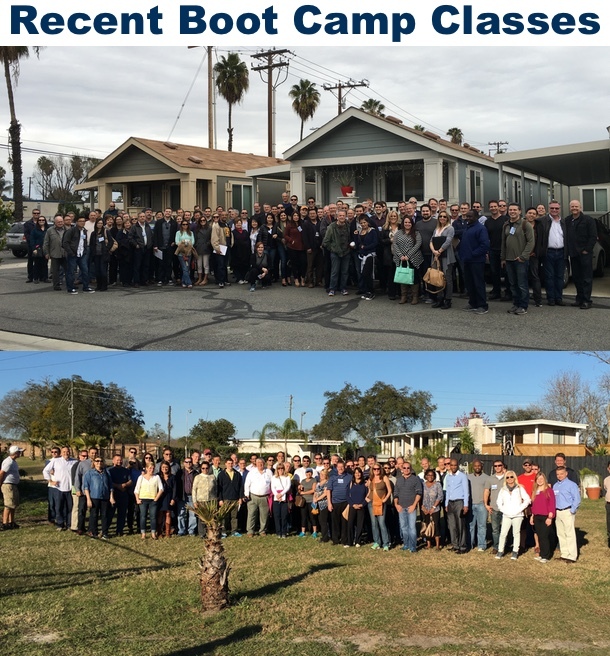 The Mobile Home Park Investor’s Boot Camp is a three-day immersion event held in both the classroom as well as in the field, inside real mobile home parks. The question and answer session is endless, continuing through lunch and dinner and often spilling over into after-hours sessions in the hotel lobby. The class format encourages questions at all times, as we believe that’s the best way to learn. Many a business partner or other contact has been found through relationships forged in the class. How to Stay on Brokers "Hotlist"
How to operate "Hands On"
I am sure we are missing something... you will have to be there to see it. Everything You Need to Know to Succeed! OUR ENTIRE HOME STUDY COURSE - FREE! If you are going to invest in Mobile Home Parks...... You owe it to your pocketbook, not to mention your peace of mind, to get advice on the reality of the business. There is no better source than Frank & Dave. They have over 25 years of experience combined and hundreds of deals done. Through their experiences they have dealt with every imaginable situation and some you don't want to imagine. Our experience has led us to the conclusion that Mobile Home Parks are one of the best investment properties out there and especially during a recession, if done properly. We have broken down and analyzed every detail of the industry and exposed what works and what doesn't. I have had the pleasure of attending one of MHU’s boot camps in Texas. Frank opened up with his humorous undertones about how the low income live and how many Mom & Pops operate parks. It is only with this frank (No pun intended) perspective that someone new to the industry can ramp up so quickly- boot camp! Otherwise it is human nature to believe & make exceptions for many of the insane stories and conditions that come with every park- as Frank also says "every park has a personality of its own”. This could not be more true, and having founded and successfully sold a business in the past, the same irrefutable laws of business buildup apply to trailer parks. Making any exceptions for residents or employees spells disaster for systematically improving the overall business. I found Frank's style to be music to my ears. Having built up a company and learning from the school of hard knocks, it was extremely impressive to see Frank give the class not just a lesson about how to acquire & manage a park but more importantly perhaps, how any business should be run. The class included the perfect park buying tool box coupled with people management concepts- doesn’t get any better than that! For anyone attending boot camp, I personally believe that the education of how to manage people alone is worth the cost, much less the added behind the scenes unfiltered curriculum of park buying. For those that have the luxury of making a boot camp & are newbies to this investment type, I must add that I had no prior real estate knowledge. For this comment to not come across as subjective, to be more specific– my knowledge of plumbing was limited to how to flush the toilet, electric included how to flip the light switch on and off, and the terms zoning and sub-metered were Greek to me. While jumping into the park business may not be for everyone, I have to throw in the old adage ‘nothing is for Free or Easy’. Now, there may be a few naysayers that say it is virtually impossible to get into without some capital but for those I say – Reference: prior statement– ‘nothing is easy’. Not being a pedigree business person myself and starting out practically paycheck to paycheck without a degree, I chose the ‘work hard’ route and bootstrapped my way to profitability before I knew there was a term for it– ‘bootstrapping’, who knew! Before MHU, we owe it to some friends of ours that first introduced us to the park business (financially retired in their late 20’s). They entered the world without a silver spoon & borrowed friend/family money for their first park. As we were killing ourselves daily we thought, this is something to look into. I owe Frank & Dave a huge thank you. They have made Investing in mobile home parks very easy for me. I have been to endless amounts of real estate boot-camps and seminars and although I gained knowledge from each event, I always left feeling like there were missing links or like I was still one step away from what I was seeking. And then… I went to Frank & Dave’s mobile home park investing boot-camp. And unlike ever before, I actually had everything I needed. I literally walked out of the event with a business plan to buy my first mobile home park and all the tools I needed to do it. I went to Frank & Dave’s boot camp in January, then 3 months later in April I had my first park under contract, and then in July, 6 months after attending their boot-camp, I was the proud owner of my first mobile home park. I had everything I needed throughout the whole process. I can’t thank Frank & Dave enough. Without Frank and Dave, who knows how many mistakes I could have made or long it would have taken me. If you’re reading this, then you’re thinking about going to the boot-camp, and if you’re thinking about going, then just do it. It’s the best value that you will find anywhere without a doubt! I have closed a 102 space park. I made $600,000 equity and $10,000 positive cash flow per month from the closing. 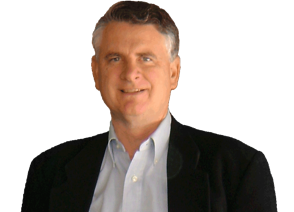 Here is my story - I went to Dave Reynolds and Frank Rolfe bootcamp in Chicago.Frank was the instructor and he taught me everything I needed to know - How to find, How to negotiate, How to do due diligence, how to get financing and how to manage a park. First time in my life I saw a Mobile Home from inside. With all the tools he gave me in the boot camp, I found an IDEAL (Infrastructure, Density, Expense, Age, Location - if you go to the bootcamp, learn it right.) park. Immediately I sent an email to Frank. I thought he will ignore my email. But to my surprise he replied within 5 minutes. He analyzed the deal for me. After a flurries of emails going back and forth between him and me, he said you are stealing the deal, go and buy it.He gave me a 30 day due diligence book during the bootcamp and I followed the book line by line for due diligence. He gave me reference to inspectors, lenders, brokers etc. I used his referrals throughout the transactions. Very nice to work with them. I bought his management course(extra course, but very inexpensive) and realize that the current owners were not managing right. So I fired the existing management. That saved me $58,000 per year. I was doing all these as if I had 10 years of experience in Mobile Home Park business. I have put another 3 parks under contract and should be closing soon. Frank reviewed those too. Thank you Frank for guiding me by my side and bringing me to the Mobile Park Industry. I could not have done it without you and still I would have been doing my old Engineering job. I owe you big time Frank. I just closed on my first park since attending your boot camp in Dallas this past July. This deal was one that Frank evaluated for me and gave it a "thumbs up" as a good deal. The park consists of two smaller parks for a total of 35 spaces and 33 park-owned homes that I plan to sell to tenants immediately. The park had a mortgage of over 500k on it and the owner hadn't made a payment in many months. In August I got the owner and the bank to accept a short-sale price of 210k. Even at 210k, no bank in the area would touch the park since it was in less than great shape and had virtually no income and expense records. The bank that owned the note agreed to finance the deal, but after months of back and forth, simply could not get the job done. However, knowing that the bank was in financial trouble I made an offer of 125k all cash, as is, and can close before the end of the year...they accepted! The knowledge I gained during your boot camp really helped me save a lot of money and totally control the negotiation process....thanks again! Hey Dave, happy new year to you and your family! My friend introduced me to the idea of Mobile Home Parks about 13 months ago. I read every book on the subject and every internet site I could find. Nothing compares to the information I got from Dave and Franks courses. I read every book they have and listened to every audio program. I attended the boot camp in July 09. Now just 8 months after I attended Dave and Franks boot camp I closed on my first park. Using the information I received I bought a fantastic park with great cash flow and tremendous upside. The day AFTER we closed a tenant had a sewer issue. I got a few bids to get it fixed. From $4500 to $6500. I was thinking this was a crappy first day. BUT I remembered a few things I learned from the boot camp. One was not to panic when this kind of stuff happens. So I thought about it overnight and by the morning had another plan. We rerouted a line and just bypassed that old pipe. Total cost. Less than $450 So my boot camp price and all my books paid off on the first day. I can't imagine doing this without Dave and Franks info. They arm you with the knowledge you need to go in confident that you will succeed. Every dime I spent I saved my FIRST day owning the park. I'm confident that the other skills I learned will save me many headaches and thousands of dollars and literally increase the value of the park. Hi guys - just wanted to let you know that i am an official member of the mobile home park owner's club!!!!!!!! I closed on the park on 12/3. I have typed new rules - will work on new lease over weekend. New owner letter went out mentioning rates would go up soon. Next week I will mail new lease, rules and letter stating that rents go up 2/1/2011.... I would like to knock these things out faster but have a day job !!! (at which i'm doing the work of 3 people during a very busy time!) plus i'm single and my poodle can't type (which sorta explains the single part!) anyhoo - thought you'd like to know! as a reminder, I'm from the Dallas boot camp in june. Thanks to your teachings, my wife and I just finished purchasing our first mobile home park and wanted to send along a "thanks" to both of you. When we initially considered getting involved in the mobile home park business, we noticed there were multiple sites offering books, manuals and "boot camps", etc. After more closely comparing the available options, your credentials and deep knowledge of the industry won us over. We subsequently purchased (and read!) all of your materials and attended one of your boot camps. We can honestly say that without your guidance and teachings, we either would have purchased a park in completely the wrong way (as we feel most other "gurus" appear to teach) or we would have been floundering with the "next steps". Although we had the natural questions of "are we wasting our money" when we first ordered your materials, within the first few chapters, we realized that we had found the right source for information. Your books and CDs did a great job of getting us up to speed regarding MHP investing, and attending the boot camp was critical for getting us past our final concerns and questions. By the end of the boot camp, we felt like we had much more clarity on what kinds of parks make money, how to analyze the numbers relating to a park, how to best negotiate with sellers and the key risks to be aware of. We also felt like we had the knowledge to operate the park after closing with the forms, leases, rules, etc. you provided as part of the boot camp. My wife and I are very analytical and detail oriented by nature and your materials are written with phenomenal clarity and depth. The 10+ years of expertise and experience you both have in the industry clearly shows. After thoroughly reading your manuals and listening to your CDs and attending your boot camp, we had few questions left about how to proceed and be successful in the business. Additionally, as we started finding parks that interested us, we followed your due diligence manual thoroughly. Again, this guided us through each step of the way, and the logic to each step was clearly explained. As we have continued to review what other websites and their associated "guru's" are peddling, we are 100% confident in your teachings, and we feel fortunate that we started our MHP investing career AFTER you decided to start teaching. Thanks again for all of your help, Steve T.
I just wanted to take a moment to express my gratitude for all of the hard work you all did putting the boot camp together. Everyone went "above and beyond" to make sure the weekend was informative and on point. I realize how demanding a schedule like that is and appreciate your willingness to share. My brain is still reeling from the information overload. There certainly appears to be a very unique profit potential in this market segment. I'm juiced about digging into the due diligence of my first park. I look forward to the chances that may come up in the future to explore opportunities. If there is anything that I may be of assistance with in this area, please do not hesitate to give me a call. I really enjoyed the MHP boot camp this past weekend. I specifically wanted to achieve three goals, improve my MHP management planning and operations, become much more efficient (and competitive) evauluating parks/making deals, and start building my network of other park investors - I accomplished all three goals! Overall, I thought the class was a tremendous value, shaving years off of the typical learning curve. I look forward to attending your next conference/convention in addition to your weekly calls. Thank you. Thanks for letting me come to the boot camp again. It was fantastic. Thanks for taking everyone to my park. That kind of exposure is priceless. I had many people comment to me about how nice the park was and how it was good to see what can be done. I wouldn't be surprised at all if a partnership opportunity comes along because people have seen what we did. Thanks for the opportunity to show what we have done. I've been talking with a few people from the boot camp and everyone thought it was good. People always say it is one of if not the best seminar they've ever been to on real estate. A real "guru" is so rare nowdays. So many have fancy presentations with little backing it. It is so refreshing to see you who has actually done what you are teaching. And done it over and over and proven your methods. Another thing you have done is managed to create a community of real genuine people. Both those directly involved with your business and those who attend the boot camps. I'm not sure how you did it but it is a completely different vibe that what I get from other industries and their seminars. I find it fascinating how even though everyone is seemingly competitors there is such synergy to help everyone succeed. I hope to see you at another boot camp with my second or third park underway. I'll take this opportunity to thank your team for the very high quality boot camp training you presented. I've been to dozens of boot camps during my 18 years involvement in buying investment real estate as my primary career and source of income. I have taken away something of value from each. I have taken my Ah-Ha moments and converted them into action that has repaid no less than 5 times the course cost in next 120 days each time. I consider your program one of the best. The interaction between Dave and Frank gave a useful perspective on various approaches to the same problems. The workbook material is thorough and well laid out. I appreciated the lack of hype, the realistic scenarios and open discussion. As an owner of three MH parks with 96 spaces for 3 years I have learned many of the lessons presented at great expense and emotional distress. Having experience behind me allowed me to absorb a great deal of subtleties from the discussion. I was very receptive to new information. I have implemented changes at my parks in the week since the course that will dwarf the cost of attending. Had I taken this training 3 years ago... no crying over past tense on my part. So, thank you again and I remain grateful for the good training. Looking forward to our next encounter, the best to each of you. With your help in directing me on my park purchase, I just received my appraisal from the bank (with whom I'm refinancing) and the value came in at 950k , not bad considering i purchased it for 550k in Feb of this year. Thanks Frank and Dave for the return calls ,emails and general NO! you gave me when i got a little zealous and impatient. it took months but your direction helped me land a park that should net me about 6-8 k per month. Ill be in touch as soon as i refi this park and move on to the next. The boot camp was an outstanding investment. Not only will I save many times the cost of the boot camp in avoiding any mistakes in the future, but the networking now opens up the doors to share deals. And of course the mailing lists is PRICELESS! I just submitted an offer on a mobile home park in IA and thanks to Frank and Dave, I'm more confident with my offer and exit strategy. Be sure to share my words with Dave, Frank and Jim. My husband and I really enjoyed the boot camp. You DEFINITELY accomplished your goal of "over delivering!" We are so glad to have come home with all the notes and books as we probably only assimilated 1% of all that! The thumb drive was EXTREMELY GENEROUS! Thank you. The boot camp was incredibly well organized and delivered in a wonderful, fun, non boring, fascinating way. I loved that the only rule was "no rules" and that we were allowed to interrupt with questions and comments at any time. I was completely fascinated by all the first hand experience and stories from people (both you and attendees) really "in the trenches out there" like Brian and I. It, for the first time, made me feel like we weren't the only ones with all these questions and concerns. The almost 24/7 complete accessibility from minute one was wonderful. You all were so approachable and it was wonderful to feel that. I really was impressed with having a format and it flowed so beautifully back and forth impulsively and what appeared to be among great comrades. High 5. The help you are continuing to offer is much appreciated and needed. I wanted to let you all know the boot camp a couple of weeks ago was excellent and I am excited to get started. Before the class, buying a park seemed very unlikely, but now doable. My first step is to get through all the material you sent, then start looking for the deals. There is a lot of material and I still have a day job! I would really like to find a way to partner on a deal with one of you experienced guys. I attended the Denver MHPS Boot Camp in July. I was amazed at the availability of Frank and Dave to mentor to us, answer our questions, provide examples of situations, share their own experiences and mistakes, and provide direction for what to do once we had left the Boot Camp. I feel prepared to take the next steps to begin evaluating a MHP, and I also know that Frank and Dave will be willing to mentor me through the due diligence on my first purchase experience. This experience is one of the best training events I have attended. I wanted to take a moment and tell you thanks for a great "reality immersion" at boot camp. It was packed full with real value that creates confidence and a method to take the next step and "tie up" a park. 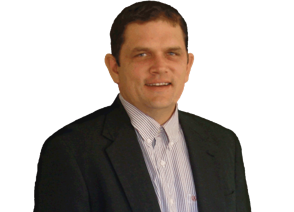 The differences between your method and Frank's was a bonus that was extremely valuable. It showed that there is more then one way to view a deal. The tour of the parks on Saturday injected some real life examples to what we leaned in our manual. I am excited and can't wait to put our first park under contract. The variety of food was excellent. That was great not to have to find our meals individually. Thanks again......you guys are awesome!!! I wanted to email you and let you know how much I enjoyed the last boot camp you held. I learned a tremendous amount and now feel confident pulling the trigger. Please send a thank you to everybody there including, Frank, Perry, Jim, Amy, Todd, etc. They were all great and I look forward to working with you in the future. I am now on the hunt for my first deal!!!! I like to thank you and Frank for such a wonderful job you guys did. The Boot Camp was really great. We learnt a lot. It was worth the time and money. I had some knowledge of MHP investments, but after taking the boot camp, I am more confident and I know what I did wrong with our MHPs. I will recommend your class to anyone without any reservation. In the near future I want to focus on improving the existing parks that we own (from the knowledge gained from the boot camp). Once I am happy with them, I want look into buying more. Thanks for offering your help. I will be in touch with you. Thank Perry for the great pictures. Hi you guys! We wanted to thank you so much for all the effort and planning that you put into the boot camp this weekend. You gave us so much "real" information that we can put to use immediately, as well as tons of things to file away for the future. We have been working on reading all the great books that were included with the boot camp and find them to be packed full of information PLUS so much fun to read after meeting you both! I just wanted to send you a quick note to say thank you so much for the excellent MHP Boot Camp! I think that you guys did a phenomenal job, and it was far above and beyond anything that could have been expected- thank you very much! Again, thank you so much. I think the weekend completely OVER-delivered and I was so impressed - thank you! My brother and I wanted to thank you again for such an amazing weekend! We both have gone to tons of courses on real estate, from flipping houses to you name it. We both agreed that yours was different because you were honest, up front, didn't sugar coat anything and everything you presented is applicable right away! I feel competent to move forward from your boot camp and we can't thank you enough for all the time and information you shared with us. Take care Frank and I'm sure we'll be speaking to you soon. After attending the Dallas Boot Camp last November, we finally closed on our first park. I'm scared, nervous, but excited. We handed out new leases and rules to the current tenants, met to train the manager, and are on our way back home from the airport. Just wanted to say thank you for running the boot camp. I found it wildly entertaining, and it's nice to meet someone on my side for a change. I feel that we got a good deal. Paid $370,000 for 26 lots currently rented for $230/mo. As a bonus, a lady paid off one of the notes immediately after closing! $3500 profit on day 1 isn't too bad. We'll save it for eviction money if needed. I have to let you know your boot camp this weekend was one of the most exceptional presentations I have ever attended. Your poise, humor and comprehensive understanding of mobile home park investing made for a great three days. Moreover, your materials gave my father the confidence to engage the mobile home park market and I hope I can join him in his endeavor. Thank you for taking a few days away from your family to share your knowledge. Hi Frank, I had to run for my fight, so I did not get a chance to thank you for everything. Thanks for putting on an information packed, comprehensive and entertaining program! I thoroughly enjoyed it and now feel very prepared to begin investing in mobile home parks. The materials you sent prior to the bootcamp are excellent as well, and you have over delivered exponentially more than anyone could expect. Your anecdotes were also incredible, as they are instructive and put Jeff Foxworthy to shame! I am so impressed with the generosity that you and Dave have in sharing such valuable tools and information!!! Please also send my thanks to the rest of your team for putting on such a great event and providing excellent training materials!! I have to say that the boot camp exceeded our expectations. Am so glad we attended before buying our first park. Now I have all the information I need to further our ventures. I loved the stories Frank told - it tends to make one remember what NOT to do and they were humorous as well. The boot camp that Dave and Frank present is extremely helpful - no matter what your level of investing in MHP's. Lots of basic due diligence training - as well as more advanced for the experienced investors. Their boot camp is given like nothing else you will ever attend. Frank will discuss his management techniques and methods. In contrast, Dave will discuss how he manages his parks, which is completely different! All to let you know there is no one specific method or manner required to operate a MHP. Just one idea will more than pay for the boot camp. And, you'll get many good ideas. Always remember, there are really 2 seminars going on all the time: the one from the front of the room; and, the one "in" the room, i.e., the networking! I want to thank both of you for being a great mentor and share your experience without conservation. I had a great time in the boot camp. Erica and I wanted to send a quick note thanking you for the terrific experience at last weekend's Bootcamp in Denver. We learned a ton and look forward to continued learning with yourself and Dave going forward. I just wanted to thank you for a great boot camp and for your generosity in sharing your extensive knowledge and experience in this business.It was really outstanding and I look forward to working with you in the years ahead. Thanks also to Jim for his insights. I really enjoyed your class in Columbus, Ohio. It gave me the push I needed to move forward. There was so much great information, but especially the people and contacts I made in class. I hope I can attend your class again in Las Vegas in January 2011. I'd like to thank you both for the great boot camp. You guys shared a wealth of knowledge. Your different approaches and perspectives add a great balance to the program. I know that my business will benefit greatly from the 3 days I spent with you. I really enjoyed the boot camp in Dallas, and am searching daily for my first deal. Thanks again for all the amazing info at the boot camp, you truly exceeded my expectations! I wanted to Thank You for all the great information and your time away from your family this weekend. I got everything I was specifically looking for and so much more. It was a great course. I wish you and your family the best. Thank you so much for sharing your knowledge so freely with me. I read what was going to be taught and had very high expectations of what I was going to receive. You guys exceeded all of my expectations!!!!! I was never bored or uninterested in any way. The two of you compliment each other……in every way. Frank you are a funny man. I enjoyed my time with you guys. Congratulations on all of your success you guys have certainly earned it. I am very excited to get started and I feel that with all the information that I received I will be able to save myself a lot of time and money. You have taught us and have given us a lot of tools that are going to save us hundreds of thousands of dollars. This class was priceless. You guys took years off the learning curve. I really appreciate all that you guys showed me. I am looking forward to staying in touch. I just wanted to thank you again for the awesome time at the boot camp! I originally read Deals on Wheels and thought that was my ticket to a new life so I spent the last six months working on my dealers license. I have almost read all of your materials and I would say they are the best out there. The event last weekend was terrific in all respects. I was able to see and hear various experiences and the consequences. It provided me with clarity about past mistakes (rental homes) and how best to plan for the future. I know you were concerned about staying on schedule with the book material. To me there was actually two seminars - one in Denver and the other when I get home to re-read the material. I have never paid $3k for a class yet felt that it was an excellent value. I wanted to personally thank you for the excellent job you did on your first boot camp. From the materials, which included cds, handouts, spreadsheets, forms, guest speakers, binders to writing equipment, you did a first-class job. Even the vans were new! I like to say thank you & Frank for all you did. It was very good and I appreciate every bit of it. The extra material on top of all material we had gotten before was very nice of you. I wish you and your family best of luck. Again thank you very much. The boot camp was outstanding! I couldn't think of how to improve it. Come Join Us for 3 days of mobile home park information overload. That is over $1,500 worth of products & services to those that attend the boot camp! This is all included at no extra charge. We want you to leave with every tool you could possibly need to go out and buy a park, operate it, increase the value, and sell it when you are ready. We are limiting this boot camp to no more than 75 new mobile home park investors. The investment for the mobile home park boot camp is $1,999 for 1 person and $2,999 for 2 people. Additional group rates are available. The payment plan options will show up on the checkout page. You can also call (855) 879-2738 or email [email protected] to reserve your spot. A: The class will open registration at 8:30am Friday morning. The class will start at 9am each day. The Friday and Saturday of the class will end between 5pm & 6pm depending on where we get in the material. The class will wrap up at 5pm on Sunday evening. Each day will have a lunch break around noon and 2 other breaks throughout the day. Q: When will we be in the field? A: We visit several mobile home parks in the area on Saturday afternoon after lunch. Transportation will be provided via a charter bus. Q: Where will the next class be held? A: The class will be held at a hotel near 16th Street Mall in downtown Denver. The exact location will available upon sign up. Q: Will you cover ________? A: Most likely, Yes! You will walk away with all the knowledge and tools you need to buy your first mobile home park or improve an existing one. Q: Is this class for only first time mobile home park investors? A: No! We have had many experienced investor's and property owners from all types of backgrounds including large park owners, apartment investors, single family housing investors, commercial and office investors. The class is designed to encompass everyone from real estate newbies to current park owners to experienced real estate investors. Q: Are there any other dates and locations available? You will be able to register for any of the upcoming classes on the checkout page. This mobile home park seminar makes mobile home park ownership three-dimensional, because it includes actual involvement in the field. You’ll see the good, the bad and the ugly – and learn why they are that way. The type of mobile home park you think you want to own will be permanently altered after this 3 day immersion in the mobile home park business.